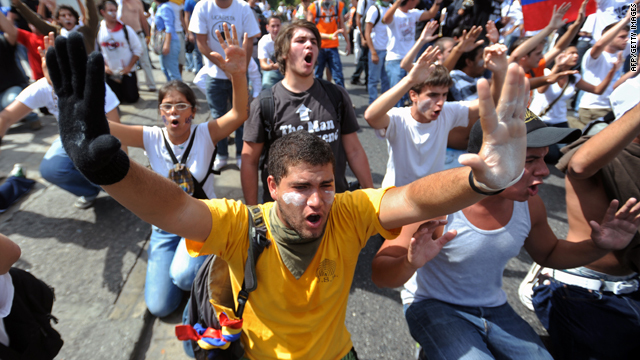 Students shout slogans at a protest against the suspension of the signal of private RCTV broadcaster in Caracas on Monday. (CNN) -- Protests over media freedom continued in Venezuela Tuesday, a day after two student protesters were killed in separate clashes. Student leaders opposed to cable operators' decision to drop five television channels, including an opposition station, for failure to follow broadcast laws pleaded for an end to the violence at a demonstration in front of the state-run broadcaster. Also Tuesday, the Interior Ministry designated four investigators to look into the shooting deaths of the two students in the western state of Merida. The protests stem from the suspension of cable station Radio Caracas Television (RCTV) and five other stations over the weekend. The stations were pulled from the air because they did not broadcast a speech by President Hugo Chavez, as required by national broadcast laws. Protesters say that the suspension of RCTV, known for its anti-Chavez slant, was provoked by the Chavez government. The Chavez government had already pushed RCTV off of public airwaves in 2007 for similar violations. Then, as now, his opponents saw politics behind the move. The street protests this week produced confrontations with police and Chavez supporters, but have been more widespread. Photos from a weekend national baseball series showed many fans in the crowd wearing red bandanas over their mouths in protest. According to the preliminary investigation, a 16-year-old student was killed during an altercation in Merida Monday night, the state-run Bolivarian News Agency reported. The teen was identified as Yosinio Carrillo Torres. In a second incident in Merida, just before midnight, another youth, Marcos Rosales Suarez, was shot when a group of unidentified gunmen fired into a crowd of protesters. "We applied the law," Chavez said in a speech over the weekend. "If they don't follow it, they won't be allowed back on the air." Many press freedom organizations, including the Committee to Protect Journalists, have urged Chavez to allow the stations back on the air right away. "Pulling a television station from cable and satellite distribution because it chooses not to carry every word uttered by a politician would be laughable if this weren't Venezuela," Carlos Lauria, CPJ's senior program coordinator for the Americas, said in a statement. "The action against RCTV is a disturbing sign of the growing censorship imposed by President Hugo Chavez. The authorities must restore all stations to subscription TV immediately." The Venezuelan embassy in the United States released a statement challenging the way the RCTV incident was being portrayed, citing "distortions in U.S. press coverage." "Once again an administrative sanction against media outlets that have failed to comply with broadcast laws are painted as measures against the political views expressed in their programming with the goal of attacking the democratic legitimacy of the Venezuelan government," the statement said. The cable stations were aware of the laws and chose not to follow them, the Venezuelan government said. "This is not a discriminatory nor arbitrary measure," the statement said. In other developments in Venezuela, the president of state-owned Banco de Venezuela, Eugenio Vazquez Orellana, announced his resignation Tuesday. The resignation follows two other high-level resignations from Chavez's upper ranks. Over the weekend, Venezuela's vice president and defense minister Ramon Carrizalez, and minister for the environment Yuviri Ortega, also resigned.